WMC's Flux Core Arc Welding focuses on fundamental welder skills. Extremely close-up video of actual welds, with detailed explanations, demonstrate how the voltage and wire speed settings, electrode extension, gun angle, and travel speed affect penetration, the shape, and the size of the weld. Also included are weld joints, metal preparation, and joint fit-up. 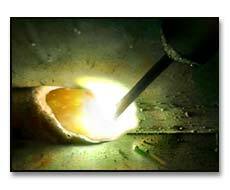 Flux Core Arc Welding also provides a "working knowledge" of constant voltage power sources, wire feed units, and the unique characteristics of flux cored welding wires. Understanding the technical aspects of FCAW is an important part of setting up the equipment to provide the correct amount of weld, with good penetration and weld fusion. For beginners and intermediate welders.